Whether you’re inspired by classic 70s rock or have an ear to create something uniquely modern, Velvet delivers stunningly realistic emulations of your favorite electric pianos. This powerful instrument plug-in precisely replicates every nuance of the original classic keyboards — both in sound quality and playing feel — and provides unrivaled flexibility to achieve sounds for any style of music. From the faintness of the lightest pianissimo to the note splat of the strongest fortissimo, Velvet is capable of delivering sounds you’d normally only hear when playing the real instrument — and those that are only limited by your imagination. Developed by the Digidesign® Advanced Instrument Research (A.I.R.) group, Velvet is a powerful new RTAS instrument plug-in that delivers highly realistic emulations of your favorite electric pianos — from classic to modern — to your Pro Tools system. 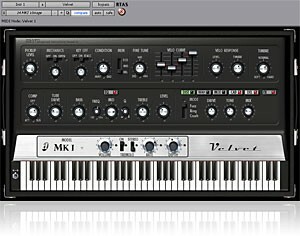 Velvet accurately emulates the nuances of the original instruments, both in sound quality and playing feel, to reproduce virtually any electric piano sound, and is based on four legendary electric pianos: the Fender Rhodes Suitcase, Fender Rhodes MK I and MK II Stage Pianos, and Wurlitzer A200. Most virtual instruments use either a sampling technique (every note is real) or a modeling technique (the behavior is more realistic) to emulate sounds and maintain performance efficiency. 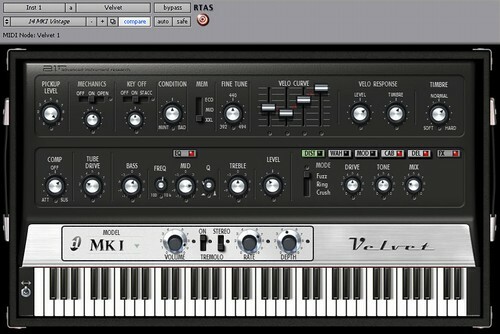 Velvet employs proprietary dynamic modeling, a unique combination of optimized sampling and modeling techniques, allowing it to achieve incredibly accurate recreations of classic electric piano sounds with superior playing feel and dynamic response. You can even pull off sounds you’d normally only hear when playing the real instrument, from the faintness of the lightest pianissimo to the note splat of the strongest fortissimo. Velvet provides unprecedented control over the sound characteristics with such realism it’s as if you were playing a real electric piano. Turn up the tube drive controls in the preamp section to warm up your tone. Adjust the timbre, dynamic response, and velocity curve to customize the playing feel. Craft your ideal sound using the built-in multi-effects processing engine, and adjust the tuning. Even mix in the sound of pedal and other keyboard mechanical noises to recreate a truly realistic electric piano feel. Whether you want to use one of the over 100 included professional-sounding electric piano presets or create something unique, dialing up the perfect electric piano sound is easy. Just select a preset and tweak away! The plug-in’s graphic user interface is reminiscent of classic electric pianos, making it familiar if you’ve ever played the real deal. And its controls work virtually almost like the originals, allowing you to easily modify sounds at the twist of a knob or notch of a slider. Velvet features a built-in preamp and effects to add a contemporary spin on a classic. Its powerful preamp section lets you shape your electric piano sound, and includes tube overdrive, compression, and a custom 3-band EQ with a parametric mid band. Process your sound further using a wide range of distortion, wah/filter, chorus, flanger, phaser, and tape delay effects — modeled after the classic originals — to emulate a vintage sound or forge something new. You can even capture the perfect vibe by adding tremolo and autopan effects, which are precisely modeled after those on the original Rhodes and Wurlitzer electric pianos. Built specifically for Pro Tools systems by the A.I.R. group, Velvet is tightly integrated with the new creative environment of Pro Tools 7 software, and designed for optimal performance and rock-solid reliability. With its unique, dynamic modeling techniques and unrivaled sound control, Velvet provides flexibility that enables keyboard players, arrangers, composers, and producers to achieve highly realistic electric piano sounds for any style of music with the convenience of a Pro Tools plug-in.